The 2016 presidential primary campaigns are now underway. The state of affairs is interesting as I write, with Donald Trump and Bernie Sanders winning big victories in New Hampshire. As things unfold, however, my interest lies less in these dynamics and more on some of the fundamentals. For example, the issue of the front-loading of presidential primaries is an important one, and I have been working on assembling a data set of delegate allocation in primaries and caucuses by date. 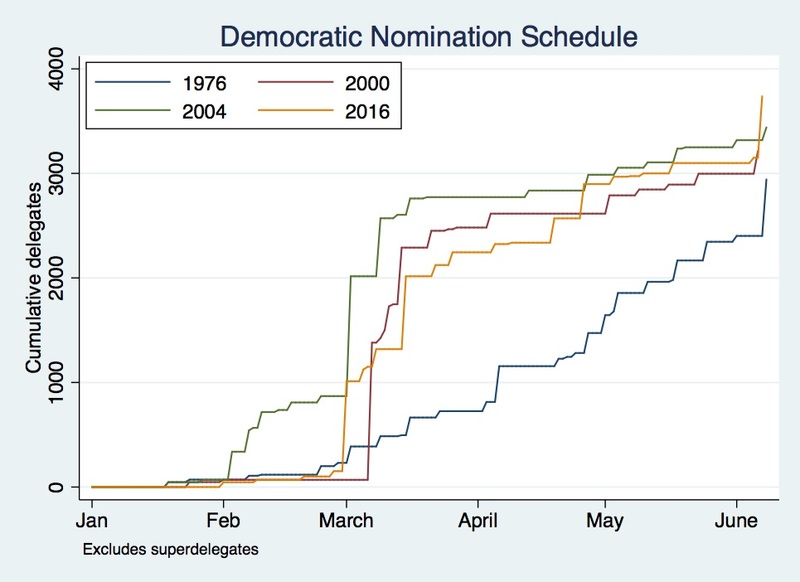 For the Democrats, below I show the cumulative number of delegates at stake by day in four presidential cycles. The caveat is that delegates are often awarded in fact many months after a primary or caucus–at state conventions–but I’m ignoring that for the purposes of outlining the speed of the nominating period (in particular with a look at what is at stake, and when, in these cycles). What is fascinating here is the change both from 1976 to 2000; and also from 2004 to 2016. The process this cycle is still greatly accelerated, but at a lower rate. The Democrats have moved their schedule back a bit from the relatively obscene speed of nominating Kerry in 2004. More complete data to come as I assemble it.